The French Alps are a fabulous place for humans and animals alike for all of the obvious reasons. There are thousands of hours’ worth of adventure waiting to be discovered. 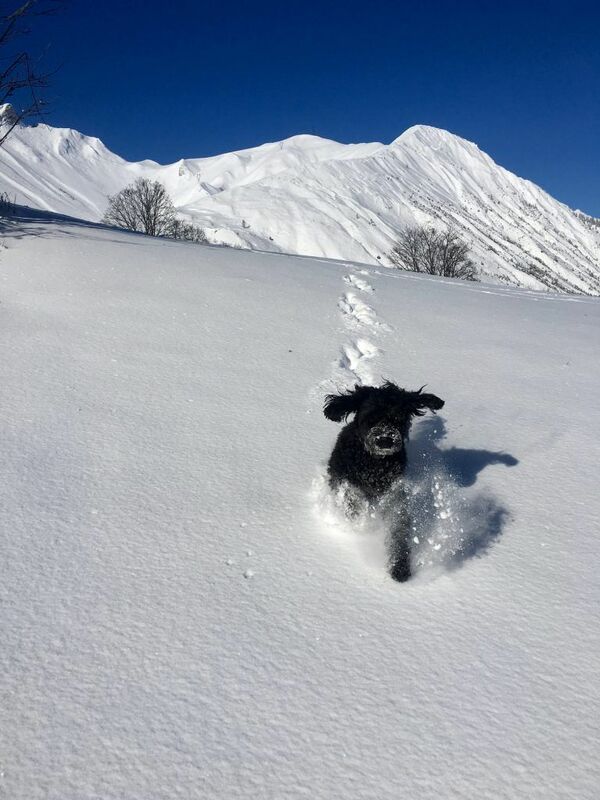 One of the questions we often get asked is about having a dog in the Alps; if it’s worth bringing your dog on holiday with you or if you’re thinking of permanently relocating here with your pets. 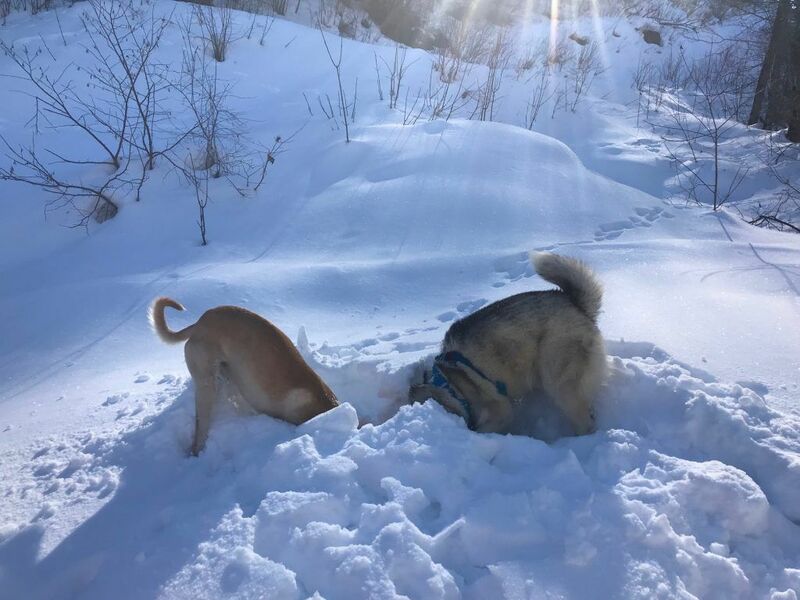 The mountains are an amazing place for dogs to run free, and having them with you on your long walks are a dream come true for a lot of dog owners, but the area doesn’t come without its restrictions. 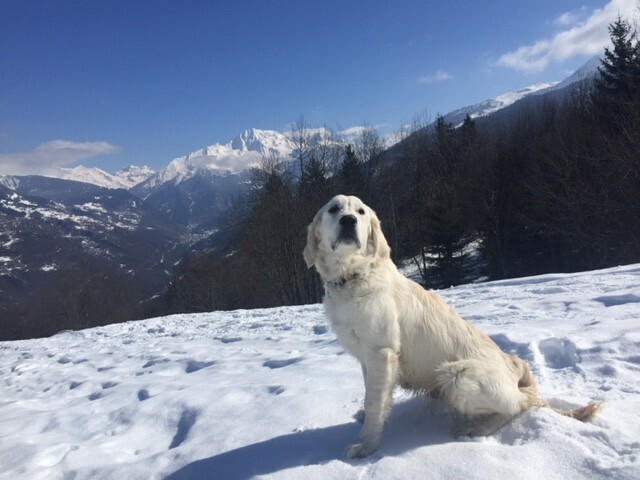 This is something that often worries people, so we have rounded up below the ins and outs of having a dog with you in the French Alps. First things first, if you own your own property then bringing a pet is, of course, entirely your own choice. 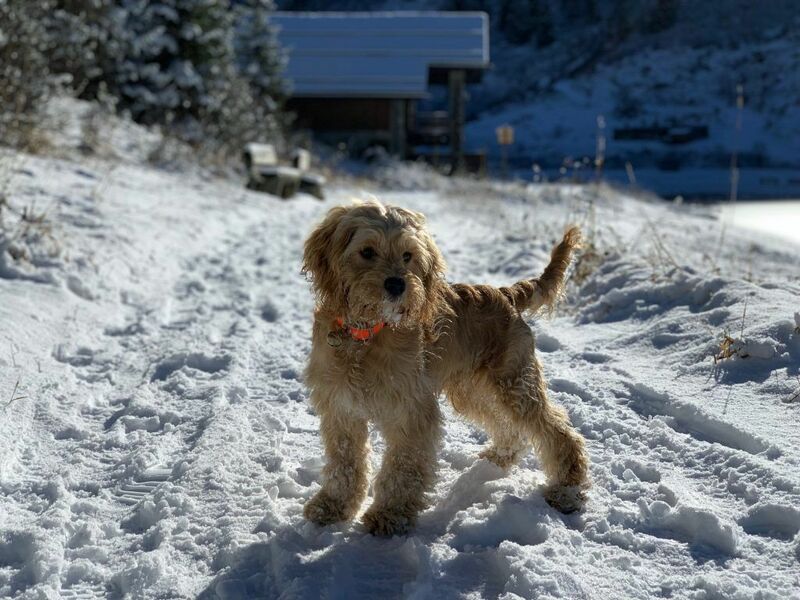 If you are visiting a chalet/apartment then there are quite a few companies who will allow pets (some charge an extra cleaning fee) but this is not as restrictive as people think. If you’re planning on skiing all day every day then it’s probably not worth bringing Ringo for him to sit inside in an unfamiliar environment all day. Crumpet, Minuit, Ouzo & Hobnob! 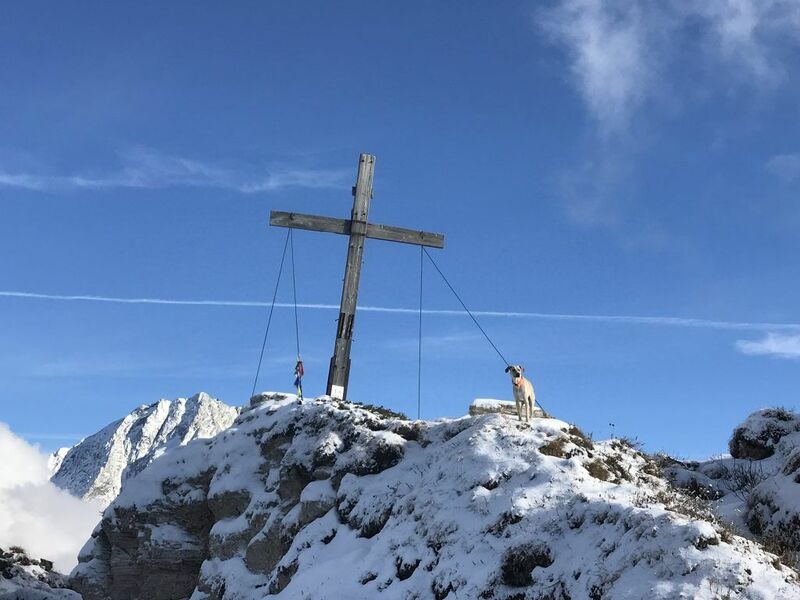 One of the main things to know, is that dogs are generally allowed anywhere around the mountain as long as they’re under control except the National Park. For example, in Méribel Mottaret dogs are allowed to walk around the Lac du Tueda but are not allowed any further into the National Park. This is to ensure the preservation of the wildlife up there and to protect the area. In French Alpine culture, dogs are generally accepted in bars and restaurants as long as they’re on a lead and happy to lie quietly with you. This is not the case in some of the high-end mountain restaurants, so it’s always worth phoning in advance if you need to take your hound with you. This makes grabbing a drink at the end of a walk very easy, especially if you’re happy to sit outside. In France, a higher population of dogs are kept as working/hunting dogs as opposed to pets, so this is worth bearing in mind when expecting your dog to be welcome somewhere. There are such a huge plethora of walks around the Alps that we have never found the National Park restriction to be a problem. Just do your research on your route before you arrive and then enjoy the scenery. The wildlife is rife in the Alps, so if you have a strongly prey-driven dog or hunting dog then I would recommend ensuring you know they won’t follow a scent. With so many smells around from the wildlife it is not unusual for visiting dogs to get distracted and take themselves off on an adventure for a number of hours! Whilst this is great fun for them, it can be extremely worrying for the owner and if the dog doesn’t know the area it can be potentially dangerous. On the plus side, when out walking you can hope to see deer, boar and maybe even a wolf if you’re really lucky! Make sure you listen to your dog. There have been times at dusk when my dog has started barking at the dark woods next to us – and I’ve gotten out of there quick sharp! There are a huge number of reasons to bring your dog on holiday with you and I’d recommend it especially if you’re coming on a walking holiday. It is (at current – who knows after Brexit!) very easy to bring them across the border if they’re happy in the car and we’ve always had a painless experienced at the Eurotunnel. Just check the most recent guidelines a good couple of months before you travel. If they implement the new ‘blood test’ rule you’ll have to be prepared 2 months in advance! Vets are just as in the UK, and if you don’t speak French you can generally muddle through in Franglais if they don’t speak English. There are also 24 hour vets in all of the valleys if an emergency did occur. Here are some of the things to know and watch out for to make sure you have a happy holiday with your pooch. Floyd – 7year old GoldenDoodle! Lots of dogs will chase skiers, especially if they’re not used to them! Our dog ski tours regularly with us and still chases other skiers if we happen across them on a walking path! Skiing with dogs. 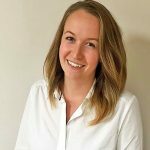 Our vet says that the most injuries she sees in the winter is people skiing with their dogs and it going wrong. Our dog was trained to stay away from skis from 12 weeks old and the slopes are busy places. It’s only really practical when ski touring – and that comes with its own host of dangers to be aware of. However, I would strongly recommend snowshoeing with your dog! A fabulous adventure for both of you and little risk of injury. Keep an eye on their paws – snow/ice/salt can make for sore paws. You can buy a number of balms to protect their pads if they’re not used to it. Dogs are welcome on some bubble lifts. If you want to get up into the mountains then generally dogs are welcome on the bubble lifts with you. One thing to be aware of when up in the mountains is that dogs are expected to be on leads unless they’re extremely well trained to stay close to you. This is for their safety as well as others on the mountain as the last thing you want is someone skiing into them. Hunting Season. Hunting season runs from September – January and is clearly advertised (it’s normally 4 days a week). During this time, the local advice is to have your dog wear a high-vis collar (as you can see in all of these pictures) as a minimum. A jacket is also a good idea and some owners choose to put a bell on the collar too. All of the local hunting dogs wear this to distinguish them apart from wildlife being hunted. 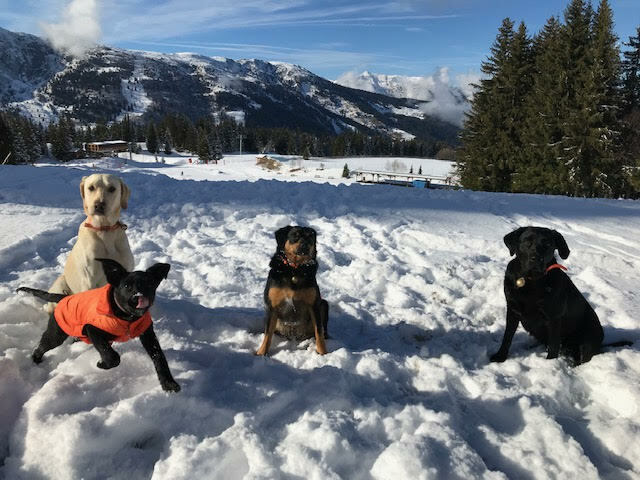 Hunting is a big part of the Savoie culture, and whilst the hunters are generally very friendly it’s definitely a wise idea to make sure your dog is under control if you come across a group of hunters. They’ve always been extremely friendly to me but I can’t imagine they’d be very pleased if my dog started chasing their prey! Temperatures reach a blissful 40 degrees C in the summer, which makes for fantastic BBQ and hiking weather! Our top tip is to get out early in the morning and watch out for signs that the heat is too much for doggo! Take plenty of water with you and make sure to rest at the streams to allow time to drink. As with anywhere in the Great British Countryside, tics are around in the Alps too – super easy to get out with a tick tweezers – but do check for them after walks. The Alps were predominantly farming communities and this continues today in the summer. With roaming livestock the farmers often get help from sheep guard dogs. These dogs are trained to protect the ‘troupeaux’ (herd/flock) from predators. As such, they’re trained that anything (human or animal) near the flock is a threat. They’re also taught that on a lead a dog is not a threat. In these areas there are signs, which I would strongly recommend taking heed of! The dogs are not a threat if you’re at a good distance and stay calm – much like walking through a field of cows in the UK. But they are by no means pets or a fan of humans. Unfortunately the increase of wolves in the valleys has led to a need for an increase of the guard dogs, which is why lots of valleys also now give out leaflets about what to do if you come across one of these dogs. Normally the Patou breed (Great Pyrenees), they look like big white mountain dogs. 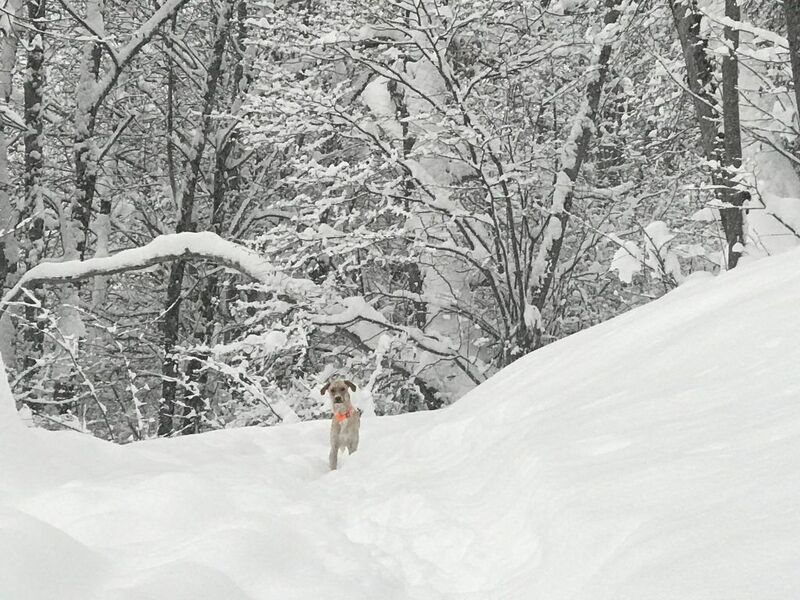 Having a dog in the French Alps is one of the best decisions we ever made. It gets us out and about and exploring areas we may not have found otherwise. He absolutely loves it, the freedom and the smells and just the sheer space on offer to him. As with anywhere, it’s more about understanding the local nuances to ensure you all stay safe. Bon Voyage!